In this hilarious guide full of honest, real-life experiences, veteran teacher Luke Reynolds skillfully and humorously shows kids how to not only survive, but thrive and even enjoy the wild adventure that is middle school. Middle grade series like The Diary of a Wimpy Kid and Dork Diaries bring an authentic voice and vision to fiction about middle schoolers. 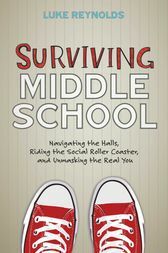 Now, for the first time a nonfiction guide to middle school offers that same funny and relatable voice, while skillfully teaching life lessons to not just help kids find their footing during the tough years between elementary and high school, but to find the joy in their new adventures and challenges. Author and teacher Luke Reynolds uses irreverent humor, genuine affection for middle schoolers, and authenticity that bubbles over as he ties real-life experiences from his own time in middle school to the experiences he has from his many years as a teacher. Covering topics like bullying, peer pressure, grades, dealing with difficult parents, and love and romance, this rare book reaches kids at a deeper level during an age when they are often considered too young to appreciate it. Readers will learn to find their own voice, begin to explore their genuine identity, and definitely laugh out loud along the way.